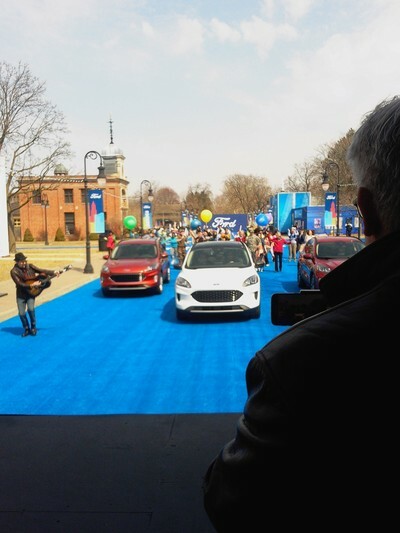 Dearborn, Michigan, April 2, 2019 --The time for double duty at Ford is over. Seems the Escape small sport utility has been filling that role for a number of years now, bringing it the distinction as the second best selling vehicle wearing a Ford nameplate, barely overshadowed by the longtime industry sales champion, the venerated F 150 pickup. But after nearly two decades as the small utility standard bearer, the Escape soon will be getting some help – a small sport utility on the same global platform as the Escape with a buff character we suspect. You might call it more the jeans and hiking boots version. Released from that duty, the Escape had nothing but the freedom to soar. Soar in styling, soar in class, soar in desirability. Thriving on all the delicious things of a “must have” crossover that now is becoming the hottest vehicle segment on the planet. 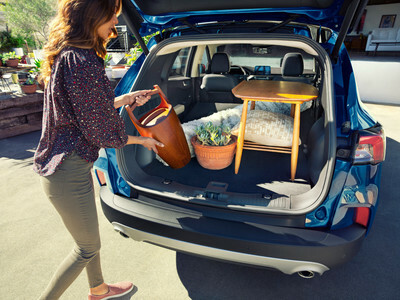 And since it launched as one of only a half dozen contenders back in 2000, the Escape has gone through three iterations with varying job assignments. The new, fourth generation, for 2020, is the most dramatic change yet, releasing all those elements you just knew were there inside that’s a perfect fit for lifestyle living in a suburb, downtown loft living, or packed for a weekend at the beach. And facing a growing field of competitors that will increase to 30 by next year, this has to make it one of the most important launches in company history. Ford, it seems, checked off every conceivable item that’s a must have for a serious, small utility shopper in the category now widely referred to as “crossover.” Those are the feature-laden, two-row, four (or five) door, five-seater versions that have been pushing sedan sales off the edge of the cliff during the past few years, with no end in sight. 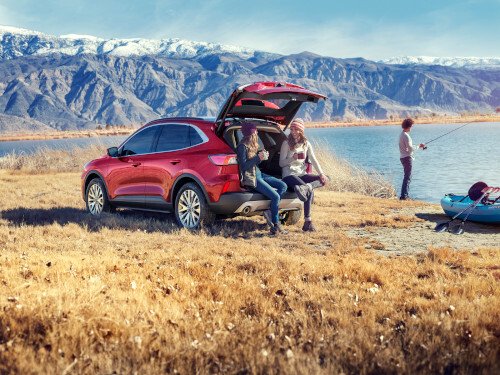 Consider what’s inside – and outside – the new Escape if you want some reasons. Stylng, with front end sports car cue elements inspired by the Mustang and GT, for a lower, more aggressive stance. A sloping, lowered roofline that improves airflow. Liftgate spoiler that adds to the planted look and control. Subtle side panel shaping that lends a subtle, sexier line. Lighting and trim elements designed to frame body lines. 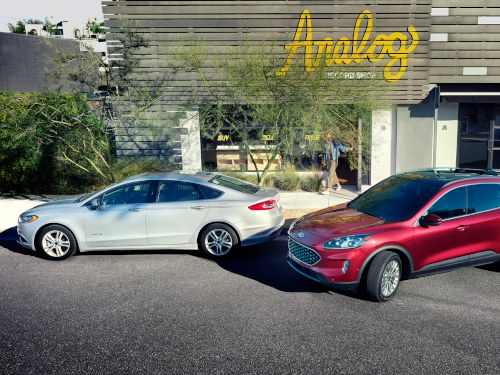 Ford cites an EPA estimated 400-mile driving range on a 14-plus gallon gasoline fuel tank, using regular, more than 550 miles with the standard, front-drive hybrid, and pure electric range of more than 30 miles. The 2.0-liter EcoBoost when using 93 octane, should grunt out 250 horsepower and 275 lb-ft of torque, bump up 0 to 60 speed and rate to tow 3,500 pounds when properly configured, according to Ford. Five trim levels are S, SE, SEL, SE Sport (hybrid) and the top line Titanium in all but the base 1.5-liter. It rides on 17-incb to 19-inch wheels. 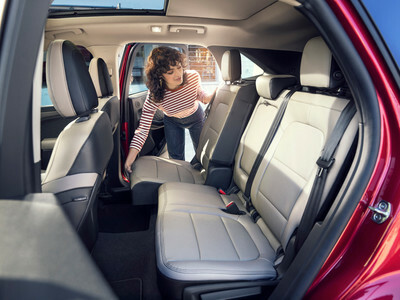 Inside there’s more head and legroom than previous generations achieved by lowering and widening plus the addition of nearly two extra inches of rear seat legroom from the rear seat track. Technology reigns, including heads up display on a clear panel rather than the windshield, must have auto high beam headlamps, and available Active Park Assist that can parallel or front-in park, on the driving ease side. Besides standard cross traffic alerts, lane keeping, pre-collision with automatic emergency braking and rear view camera, post collision braking, there’s available evasive steering assist and stop and go adaptive cruise control with lane centering for safety. Five driving modes from standard to slippery and sport actively display on a driver’s center screen. And the Escape will never be out of touch with 4G connectivity capable of accommodating 10 to 20 devices and dismiss outside noises buffered by acoustic laminated side glass and active noise cancellation. Ford made no apologies in how it presented the upcoming Escape in its new role. In what has become typical Ford fashion, the company didn’t spare any special effects in pulling off the wraps. Gone are the days when the original Escape was revealed inside the Ford Design Center with a cutaway – looking like someone had sliced a deli sandwich in half from the top down – with all the strengthened unibody construction, and four-wheel independent suspension and all the innards such as wiring, gears, engine with its pistons, fuel tank and more – clearly visible. Fast forward to last Thursday when a cast of nearly a thousand – literally – turned out in a venue that had Broadway opening night, Superbowl halftime and Summer Olympics opening ceremony bravado wrapped into one. In a move it did because it could, it claimed ownership for a day of historic Greenfield Village at The Henry Ford museum complex adjacent to company headquarters. And brother did it take off from there. On cue, several football field lengths of bright blue carpeting covering village museum streets were inundated with dancers, athletes doing backflips, shooting basketballs, skimming around on scooters, singing, playing guitars, each carrying or wearing some text aspect of the new Escape’s innovations. Every visible prop, fixture, even buildings inside and out such as the original Ford factory from founder Henry Ford’s days to the airplane originators Wright Brothers’ bike shop were emblazoned with banners citing features on the new Escape. By the end of the five hour launch, everyone seemed pretty well spent, but not so much they weren’t warned to keep the whole experience under wraps until this morning at the prospect of never being invited again. We aren’t sure how Ford managed to keep the local traffic helicopters and drones covering the huge metropolitan Detroit area that’s home to nearly 4 million from spying and reporting on the setup ahead of time. Those fields of electric blue tapestry should have been visible for many air miles, including from planes at Detroit’s nearby international airport. Maybe they have friends in high places.